One level open concept home. Enjoy your large granite kitchen island that overlooks the Great Room. 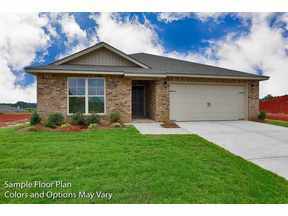 Granite, backsplash, walk-in pantry, and GE stainless steel appliances included. Master Bedroom is isolated and has master bathroom suite with large walk-in closet. 2 car oversized garage and large covered back porch for your outdoor pleasure. PRICEVILLE CITY SCHOOLS! 100% financing available for qualified buyers. Lower energy cost with included energy efficient features. New Home Warranty.